Houston Methodist's new campus in The Woodlands will be modeled after the healthcare system's Houston Methodist West campus, located near Katy. The hospital will include 193 beds. THE WOODLANDS, TEXAS -- Healthcare system Houston Methodist has purchased a 57-acre tract in The Woodlands for the construction of a 470,000-square-foot, 193-bed hospital. The Howard Hughes Corporation and its wholly owned subsidiary, The Woodlands Development Company, will develop the property on the site, located south of the intersection of I-45 and State Highway 242. 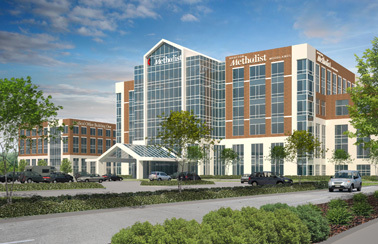 The campus, which will be modeled after Houston Methodist West near Katy, will feature a 135,000-square-foot medical office building in addition to the hospital. The entire project is valued at $328 million. The hospital is slated for completion in early 2015, with opening planned for 2017. The medical office building is slated for completion in late 2015. 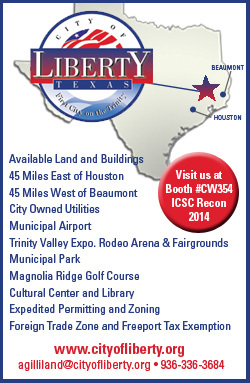 Robert Parsley and Coy Davidson of Colliers International represented Houston Methodist in the land acquisition. The new property will be the fourth hospital campus in The Woodlands and the eighth in the Houston Methodist system. StreetLight's new 212-unit apartment high-rise will stand 23 stories. DALLAS -- StreetLights Residential (SLR) has broken ground on a 212-unit high-rise apartment property in the Uptown area of Dallas. 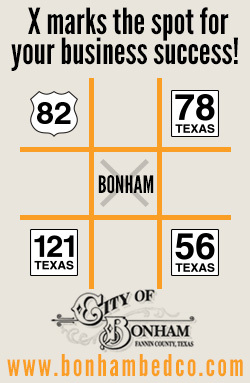 The project, located at the intersection of the Maple/Routh Connection and Thomas Avenue, will stand 23 stories and include one- and two-bedroom residences. Gromatzky Dupree & Associates designed the building, Waldrop + Nichols Studio LLC designed the apartment interiors, and Studio Outside is designing the landscaping. SLR Uptown Construction LLC is the general contractor. 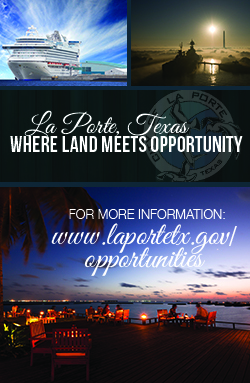 The first units at the yet-to-be-named property are slated for delivery in late 2015. 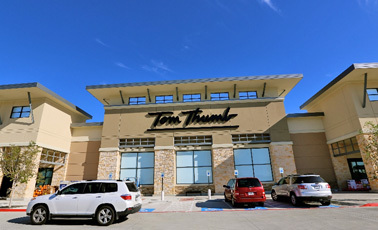 A 70,000-square-foot Tom Thumb store anchors Westside Market, which is located on the corner of FM 423 and Lebanon Road in Frisco. The property was 98 percent leased at the time of the sale. FRISCO, TEXAS -- Disney Investment Group (DIG) has brokered the sale of Westside Market, a 93,562-square-foot grocery-anchored shopping center in Frisco. Tom Thumb occupies 70,000 square feet within the property, which also features a Tom Thumb fuel center. Located on the corner of FM 423 and Lebanon Road, the asset was 98 percent leased at the time of the sale. David Disney of DIG represented the unnamed seller in the acquisition and also procured the buyer, Inland Real Estate Acquisitions Inc. Matthew Tice of Inland facilitated the purchase on behalf of the buyer. 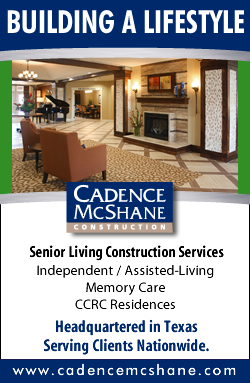 "Seniors Housing Business is very excited to partner with ASHA on what is a 'must-read' for everyone in seniors housing as well as those considering getting into this growing sector of commercial real estate," said Richard Kelley, publisher of Seniors Housing Business. "ASHA's decision to work with Seniors Housing Business is a reflection of how the magazine has become an integral part of the seniors housing industry. 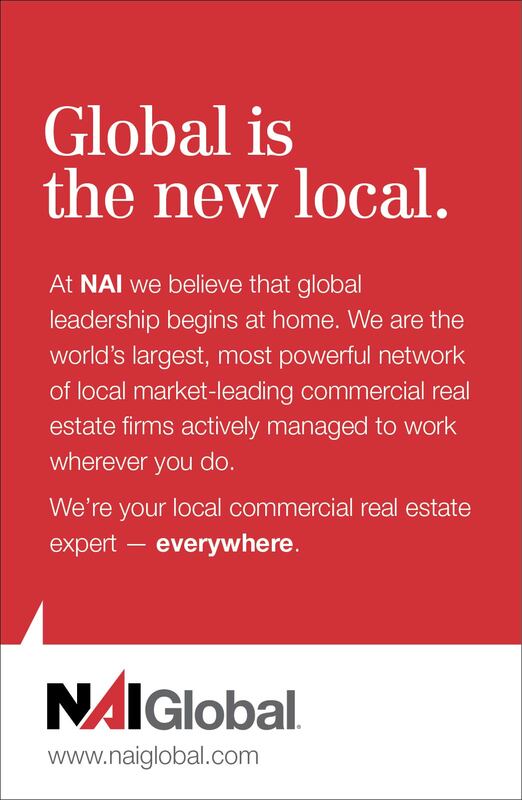 The ASHA 50 will not only reach all of our Seniors Housing Business circulation, but will also be mailed with the circulations of France Media's five regional commercial real estate magazines (Northeast Real Estate Business, Southeast Real Estate Business, Heartland Real Estate Business, Texas Real Estate Business and Western Real Estate Business) to give ASHA and this burgeoning asset class the widest possible exposure and reach." The Landing on Sixth offers studio, one-, two- and three-bedroom residences, plus amenities such as a swimming pool, playground, clubhouse and fitness center. McALLEN, TEXAS -- Berkadia Commercial Mortgage LLC has arranged an $8.3 million loan for the acquisition of The Landing on Sixth, a 150-unit multifamily complex in McAllen. 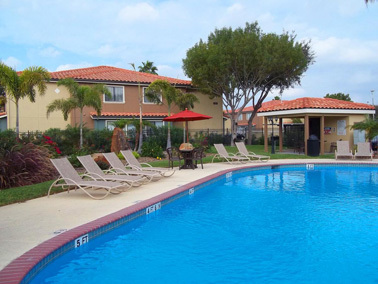 Located at 4401 N. 6th St., the property offers studio, one-, two- and three-bedroom residences, as well as a fitness center, playground, swimming pool and clubhouse. Michael Levell of Berkadia worked on behalf of the borrower, Juniper Investment Group, to secure the 10-year Fannie Mae loan, which includes a fixed interest rate of 4.87 percent and 30-year amortization schedule. 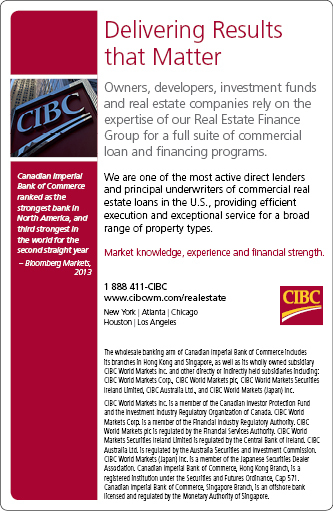 The property was 98 percent occupied at the time of the loan's closing. 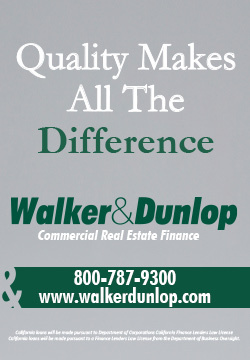 Capital Partners LLC acquired the warehouse property, which is located on 2.5 acres at 1101 Avenue G in Arlington. The facility features 18-foot clear heights and three dock-high doors. 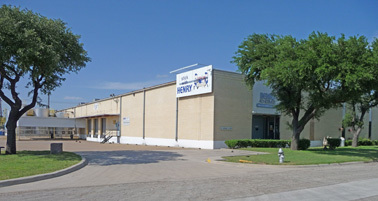 ARLINGTON, TEXAS -- Lee & Associates has brokered the sale of a 60,546-square-foot industrial property in Arlington. The building, located on 2.5 acres at 1101 Avenue G, features clear heights of 18 feet, three dock-high doors and two grade-level doors. Mark Graybill, Tom Walrich and Reed Parker of Lee & Associates represented the seller, W.W. Henry Co. LP, in the transaction. 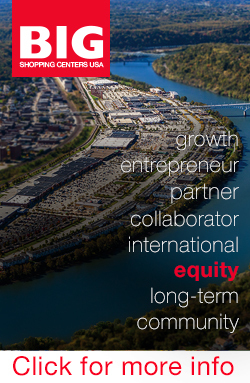 Nathan Lawrence of CBRE represented the buyer, Capital Partners LLC. The property, currently operated as Antler Mini Storage, is located at 824 Wagon Trail, in proximity to I-35. 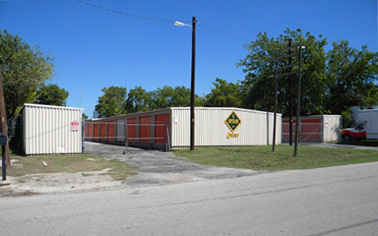 AUSTIN, TEXAS -- Marcus & Millichap has brokered the sale of a 64-unit self storage facility in Austin. The property, currently operated as Antler Mini Storage, is located at 824 Wagon Trail, in proximity to I-35. Nicholas Ling and Jon Danklefs of Marcus & Millichap, marketed the asset on behalf of the seller, a private investor, and also secured the buyer, another private investor. Flow Solutions Holdings Inc., a valve solutions provider, will occupy the facility located at 14710 Vickery Drive. The facility includes 1,800 square feet of office space and 28-foot eave heights. 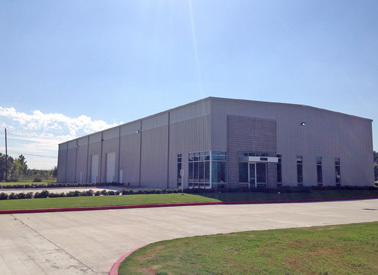 HOUSTON -- United Equities Inc. has arranged a 15,680-square-foot industrial lease in Houston for Flow Solutions Holdings Inc., a valve solutions provider refining, petrochemical and energy industries. 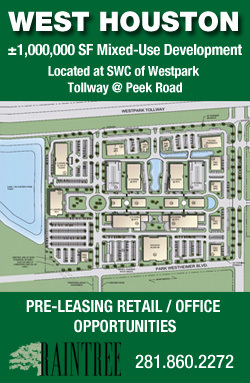 The tenant will occupy the warehouse located at 14710 Vickery Drive, which is located in proximity to Beltway 8, Houston's outer loop. The facility features 1,800 square feet of office space and 28-foot eave heights. Doug Freedman of United Equities represented the landlord, Vickery-Aldine Bender LLC. 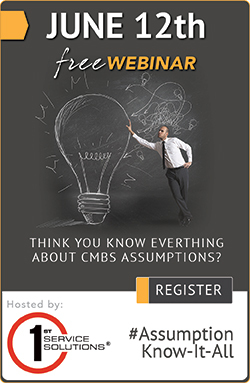 Billy Gold of CBRE represented Flow Solutions.